Dixie; He was nicknamed Dixie, because of his dark skin. Dixie was a reference to the Deep South of America where so many black people lived. Dean, despite his boisterous manner, was an intelligent and deep thinking man and he thought Dixie was an insult - more to the Deep South than to him. He could not abide it. Born 22 January 1907 in 325 Laird Street, Birkenhead, Cheshire [registered in Birkenhead, March 1907]. Attended Laird Street School and Albert Memorial Industrial Borstal, both Birkenhead. According to the 1911 census, William is the youngest of six children and the only son to William and Sarah (née Brett). They live at 325 Laird Street in Birkenhead. His father is a loco engineman. On 8 October 1930, in a court case against Dean, his address was stated as being Wellesley Street in Birkenhead. He was charged with dangerous driving on 21 August after he knocked down a woman who was boarding a tramcar, of which he was aquitted. At Christmas 1933, Dean was living at Caldy Road in Walton, when his prized possessions were stolen, his international cap and a presentation clock. Again, on 4 April 1940, Dean was summoned to court for non-payment of taxes on his sports outfitters shop (opened in Birkenhead, July 1934). Now living at New Ferry in Cheshire, he owed £22 1s. 5d.. The case was adjourned to see if Dean could sell his business that had been making a loss since the outbreak of war. According to the 1939 register, William, an ex-professional footballer, is married to Ethel, and they are living at 193 Rutland Road in West Bridgford. with two of their sons, Geoffrey and Ralph. Married to Ethel Fossard (b.3 November 1911), 19 July 1931 at St James' Church, Birkenhead [registered in Birkenhead, September 1931] died in 1974. Four children, William J. (1932), Geoffrey D. (1935), Ralph L. (24 September 1936) and Barbara A. (1945). Died 1 March 1980 in the Main Stand at Goodison Park, Everton, aged 73 years 38 days [registered in Liverpool, March 1980]. Following a heart-attack, watching the Merseyside Derby. Height/Weight 5' 10½", 12st 7lb. [1928 to 1930]. Biographies Dixie Dean: The Official Biography of a Goalscoring Legend - Nick Walsh (Macdonald and Jane's, 1977)*. Dixie Dean of Tranmere Rovers 1923-25 - Gilbert Upton (The Author, Southport 1992)#. *William Ralph Dean was one of the game's greatest goal-scoring centre-forwards throughout the twenties and thirties; In 1936 he topped Steve Bloomer's long-standing scorer's record. Tranmere, Everton, Notts County and Sligo Rovers all figure in his story. - A Football Compendium, Peter J. Seddon (1999). #Dean made his debut for Tranmere in 1923 at the age of 15. This biographical treatment covers those early days before he achieved folk hero status at Everton. - A Football Compendium, Peter J. Seddon (1999). Played for Birkenhead Schools and Moreton Bible Class. Ehile he was an apprentice fitter on the Wirral Railway, Dean played his junior football with Heswall FC and Pensby Institution FC, from where Tranmere Rovers FC signed him as a fifteen year old in November 1923, originally as an amateur and scored 27 goals in thirty league appearances. Despite interest from The Arsenal FC and Newcastle United FC, Dean joined Everton FC in March 1925 for £2500, and despite a bad motor-cycle accident in Holywell in the 1926 spring, which fractured his skull, only returning in the October, he would play 399 league matches, and score an astonishing 349 goals. The New York Giants 'Soccer' team offered £10,000 for Dean in July 1928, offering £25 per week in wages. [Real] Madrid CF even courted Dean's services in January 1932, again offering £25 per week. Even Burnley FC in September 1937 were rumored to be after him. In all cases, Dean was not interested. Dean was eventually transferred to Notts County FC on 11 March 1938 for a £3000 fee. After struggling with an ankle injury, he had his registration cancelled by Notts County FC in early January 1939 after nine league games and three goals. Instead of giving up un football, he then accepted an offer to sign for Sligo Rovers FC on 20 January 1939. In the meantime, however, County still owed £1000 of the original transfer fee, so on 1 February 1939, after the Notts club had sent deputation, Everton allowed a £500 rebate. Which was duly paid. Dean made seven Irish league appearances, scoring ten goals. He finished his career in the Cheshire County League with Hurst FC on 23 July 1939, after which he retired, totaling 379 goals in 437 league outings. He had had numerous operations on his ankle, removing loose bone. Distinctions: Holder of the Football League seasonal scoring record (sixty in 1926-27). In 1928, Dean fronted an advertising campaign for Wix Cigarettes. 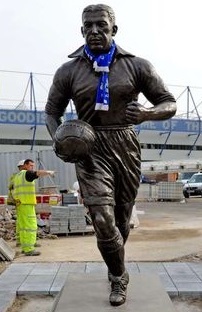 His statue (left) was unveiled outside Goodison Park in May 2001. Player number One of five who became 512th player (515) to appear for England. First match No. 152, 12 February 1927, Wales 3 England 3, a British Championship match at The Racecourse, Mold Road, Wrexham, aged 20 years 21 days. Dean was obliged by ill-health to give up his employment as a Chester licensee, The Dublin Packet, in 1962, after which he worked for the Littlewoods Pools. In November 1976, due to his declining health, Dean had his right leg amputated because of a blood clot. - An English Football Internationalists' Who's Who. Douglas Lamming (1990). Hatton Press, p.85/86.